The 2014 National Electric Code added a new section of code 690.12 requiring "Rapid Shutdown of PV Systems on Buildings". Below is the first of 1 of 2 articles we put together to help you understand this code (here is the other: 2014 Rapid Shutdown - More on Wire Length). 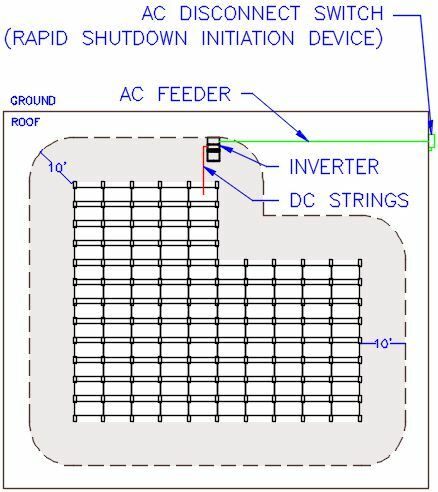 In the event of an emergency, the emergency responders can initiate the rapid shutdown device, then safely move around the roof knowing any areas within 10' of an array may be energized, but as long as they remain greater than 10' from a PV array any solar AC & DC conductors they encounter will be de-energized. (1) Requirements for controlled conductors shall apply only to PV system conductors of more than 1.5 m (5ft) in length inside a building or more than 3 m (10 ft) from a PV array. (2) Controlled conductor shall be limited on not more than 30 volts and 240 volt-amperes within 10 seconds of rapid shutdown initiation. (3) Voltage and power shall be measured between any two conductors and between any conductor and ground. (5) Equipment that performs the rapid shutdown shall be listed and identified. Controlled Conductors - These are any conductors that extend beyond 10' from an array. Any conductors within 10' of the array are not considered "controlled conductors" and not subject to the requirements in this section (they can stay energized all the time). This applies to both AC and DC conductors, which you will have with string inverters on the roof. String inverters - For the DC portion of the system, by placing string inverters within 10' of each array it's fed from, there will inherently be no controlled conductors further than 10' from the array. However, you must be careful that the string inverter make & model you select does not have capacitors on the AC or DC side that may discharge for several minutes after the switch in thrown which will energize the conductors for more than the 10 second limit in (2). As you can see, the DC conductors are all kept within 10' of the array, so there are no "controlled conductors" in this example. In this case, achieving rapid shutdown is straightforward with no additional equipment or provisions necessary. However, its not always so cut and dry. What happens when you have multiple subarrays instead of just one connected to an inverter? Then the code can get a little more confusing, but we have a straightforward philosophy for solving this situation. Read more on this scenario in our other blog article here . Use of contactor relays: Where the conductors must extend beyond 10’ from a PV Array, we can use contactor relays to de-energize the controlled conductors. The contactors are kept in the closed state by voltage sourced from the Solar’s AC system. Once the Solar Generator Disconnect Switches are switched to the open position, AC is removed and the contacts open, de-energizing any conductors outside the controlled conductor zone. Central Inverter: If you had the same array on the roof but were using a central inverter on the ground, this method wouldn't work exactly the same. The good news is, there is no AC on the roof to worry about. The bad news is, the DC is not as straightforward and requires additional expense to implement. You can place the combiner box within 10' of the array, but you would still need to have a disconnect switch or contactor inside the combiner box that disconnects the DC output feeder when the rapid shutdown device is initiated. Otherwise, the live DC conductors would extend beyond 10' from the array. Additional control wiring is necessary to control the switch in the combiner box to disconnect and de-energize the feeder running to the edge of the roof and down to the inverter on the ground.